A new image has appeared in the Photos folder on the desktop of the STIES site. In order to access the image, move the terminal window out of the way and then move the "Print" window and you'll see 3 folders, open the Photos folder and double click on the FFSHcom image the password is toadfish112, once the image is open you can double click on it again to access a higher res version, user name and password are both toadfish112. means you've found each other. for your willingness to help and trust me. There also appears to be some sort of drawing or floorplan map that has been severely damaged and smeared due to what looks like water damage. The only other thing I noticed about the image was that there are words on the spine of the book in the upper right. All I can make out is "By Dr. Leyda Cupe". This lead to find this site http://revalistic.com/ which mentions Leyda Cupe and area 51 and other stuff that seems related to all of this. Th e three dots are on the bottom of the page. They’re smeared a bit though. Cause I also get this feeling that the kids are friends of the monster. The most convincing thing is the end of the Superbowl trailer where the brown headed boy is looking up at this light and reaching his arm up, looks like a goodbye scene. Why would you say goodbye if you were scared of it?? Maybe the military attacked the creature with no good reason except that it just looks scary, didn’t actually hurt anyone. It could be the scariest thing you ever saw, but still be quite harmless. Elliot and family were scared of E.T. until they realized he was friendly and not a threat.. however if the Super 8 monster does get violent, I think it will be out of fear or self defense. wowww… i never saw iron giant and had no idea what the movie was about except a giant robot, so i googled it and yeah, it sounds like i just described that movie! hahaha omg that was my favorite movie when i was younger. it still is a very good movie. well, i just watched it today out of curiousity, and OMG! It was a really good movie but there are so many similarities to Super 8! I don’t think Super 8 is Iron Giant or anything, but gosh, there are a lot of things in common with both movies. GROOM LAKE IS LINKED WITH AREA 51! I RESEARCHED IT ONLINE AND I AM NOW 80% SURE THAT GROOM LAKE IS THE “GL” IN TROGL! Sorry about the capitals, I got excited. PROJECT SeeSaw: Airborne electronic warfare equipment, groom lake. Answer to the question on Revalistic site. I know there is no shortage of crazy rumors about Area 51, but I also know that there at least a few thousand of you who work[ed] at Nellis. Anyone have anything interesting to send me? Anyone know any of these people? Anyone know what Seesaw might mean in this context? Does that TROGL movie have any relivence to super8 viral? I was gonna go see Battle Los Angeles anyway, but now I am more excited for the new Super 8 trailer than the Battle LA movie! I can’t wait til tomorrow night!!!! Groom lake is area 51/aka-THE BOX/Dreamland, Paradise Ranch,Home Base, Watertown Strip…..
Its a cave. Trogl means cave/ cave dweller. Maybe someone lives in the cave trying to help them. Or maybe the cave is where they were working on the energy source. The picture with the energy cube looks like it may be in a cave. well, that’s hard to do being that there are so many posts to sift through… I think some of the “oldies” should be a bit more nice and understanding and skip the redundant posts by newbies that they don’t want to read. what i mean is that a lot of this stuff has been touched quite a while ago when other clues have been brought forward. i think the timeline is a good place to start for anyone new to this. Well Jenkins, who are you to have a go at the newbies when I’ve never seen you on here before! yippee skippee! I can’t wait! I know I won’t want to blink during it cause I will miss something! I just saw the trailer, it’s f*cking amazing! Noob here, but I didn’t see this mentioned earlier, we all do see that “vitas relic” jumbles easily to “revalistic” – any thoughts on “vitas relic”? OK, the note doesn’t say “Use them.” it says “Use Thena” look again… this I believe is short for “Use Thenardite” I found this from typing “Uses of thena” into google. If you look at this mineral in Wiki it is quite interesting… it forms white crystalline structures similar to the cubes in the mysterious images popping up. Now look at the Wiki definition: Thenardite is an anhydrous sodium sulfate mineral, Na2SO4 which occurs in arid evaporite environments. It also occurs in dry caves and old mine workings as an efflorescence and as a crusty deposit around fumaroles. It occurs in volcanic caves on Mt. Etna, Italy and was named after the French chemist, Louis Jacques Thénard (1777–1826). Thenardite crystallizes in the orthorhombic system and often forms yellowish, reddish to grey white prismatic crystals although usually in massive crust deposits. Thenardite is fluorescent, white in shortwave and yellow-green in longwave UV radiation. In humid conditions, thenardite gradually absorbs water and converts to the mineral mirabilite. So it occurs in arid environments such as the Nevada desert (Yucca Flats – check out the crystal links site!) The US were performing underground nuclear tests in 1962 (The mysterious date) Also the mineral it converts to (mirabilite) is found in large amounts in the dry lakes of the Nevada Desert. The US set off a nuclear blast in the Nevada desert (Probably underground at Groom Lake – or a part is found here)and this somehow puts a spark of life into Thenardite (possibly inter-dimensional life?) The mysterious formation is collected and experimented on in a test facility. This would explain the crystal structure in the glass container. The substance is attracted to water perhaps and becomes violent in trying to feed the hunger for moisture. The multiple samples escape and form a larger floating crystal being. It is captured and probably deemed too dangerous and is shipped to a more secure dry facility. This is when it escapes… starts destroying things and begins to form into a more advanced being. I strongly think the kids will find it in the water tower from the poster (Notice the glow from inside!) This is where it begins to become something the kids want to protect. okay, i think we all agree on one thing: the rubik cube-thing has to be the Vitas Relic. It has to be, or else TROGL wouldnt be so hot and worried over it. Also im confused: TROGL sent a picture of Josh’s dad over STIES, and we definitely know that Mr. Minker was indeed the driver of the truck. But heres where im confused: The sheriff kinda acts more of an actual biological dad than Mr. Minker. Could it be that the Sheriff adopted Josh and married his mother when Josh was a baby? Just a note about TROGL – a Troglodyte is one who lives underground – note the Rocket Poppeteers clipping about going underground. If you google “p. p. 1912 subj incd trvw ex. ia” from the trailer, this comes up… Is it possibly related? It seems like it could be part of the viral campaign. Do you remember the two newspaper printouts for Rocket Poppeteers? 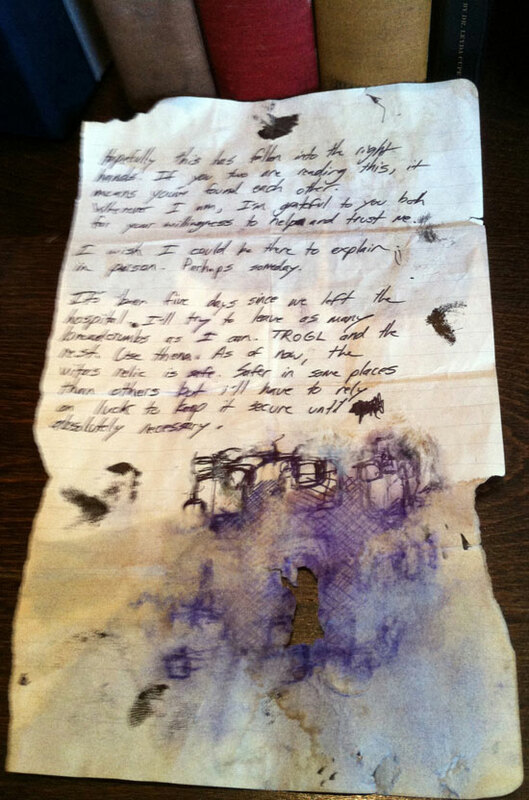 I was looking at this note and thought there may be something similar here? The ink blotches and smudge marks look very deliberate and also the obvious hole in the sketch…..
…What could it line up with though? Maybe the map of the missing dogs from the trailer? hmmm… http://revalistic.com/ letters rearranged can = vitas relic.. ? Just sayin.. When searching the web, I came across your blog. Curious, I looked here often.